A Simple, Durable Feeder 19 1/2″ tall. Made of four 18″ 1x4s, a beveled cover cut from one 6″ long 1x6, a 2″ x 3 1/2″ x 3/4″ block floor, six 3/8″ dowels and 3 internal hoods cut from recycled narrow plastic bottles. Accommodates most any type of feed: sunflowers, thistle, corn, peanuts, millet or mixed. 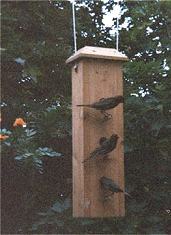 Accommodates six feeding birds at one time in six squirrel proof 1″ diameter x 3/4″ deep holes each above a single perch. Squirrels try but can’t retrieve seeds through the deep and narrow holes and eventually give up. Minimizes food waste by maintaining the surface of the seeds inside and below the holes. 1″ diameter feeding holes keeps larger bullying birds to a minimum. Easy filling. Slide the roof up, pour the bird seed in the top and roof falls back into place. Durable 3/4″ thick softwood and screw construction. Securely suspend so the bottom of feeder is about 4′ above the ground where it can be easily reached for safe refilling and in an open area where predators cannot sneak up on feeding birds. Do not hang from from balconies and other dangerous heights. Is heavy. All hanging items eventually fall. 1. Fasten one side to the front panel and one side to the back panel with screws. Make certain upper and lower ends are aligned. rope holes are drilled near the top of each side panel. Feeder holes are drilled above dowel holes (for perches) in front and back panels. 2. Fasten floor to back panel with screws. Floor is fastened from back side only to prevent splitting. 3. Lay back panel (with floor) on its back and insert hoods in curved grooves. Cut hoods from plastic fluorescent tube guards or discarded small cylinder-shaped plastic bottles. 4. Carefully lay opposite set (front & side) in place making certain each hood fits into curved groove by pushing with a finger inserted into the holes. 5. Fasten two sets together with screws. 6. Snug fit perches into dowel holes. Glue if necessary. 7. Thread rope through holes in roof and side panels. Tie knots in each rope end and tighten securely. 8. Suspend from secure hooks, nails, or wire from tree branch, eave, or post. 8. Suspend from secure hooks, nails, or wire from tree branch, eave, or post so that the bottom of feeder is about 4′ above the ground where it can be easily reached for safe refilling and in an open area where predators cannot sneak up on feeding birds.